Ba Jin, pseudonym of Li Yaotang (李尧棠), was one of most important and well-respected writers of the twentieth century in China. He was born in Chengdu, Sichuan in 1904, but lived in Shanghai for most of his adult life before his death in 2005. Ba Jin was prolific, publishing 14 short story collections, 19 novels, and reams of non-fiction works, memoirs, and letters. His most critically acclaimed fiction was written during the 1930s and 1940s, but his influence extended into the 1980s. 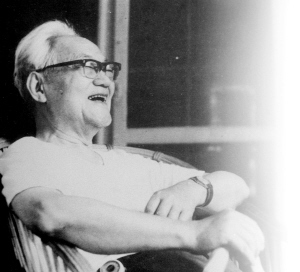 During the Cultural Revolution he suffered some criticism, but was officially rehabilitated in 1977, and appointed Chairman of the Chinese Writer’s Association in 1983. As a young student in Chengdu, Ba Jin was deeply affected by Piotr Kropotkin's pamphlet ‘An Appeal to the Young’ and began campaigning for anarchist groups. He is supposed to have met with activists Emma Goldman and Alexander Berkman while living in France in 1927-8. After his return to Shanghai in 1928 he started editing for publishing houses and magazines, and writing his own works. His two famous trilogies were written in the decades that followed. The‘Torrent’ trilogy《激流三部曲》includes his most celebrated novel, ‘Family’《家》(1931), and was later completed with ‘Spring’《春》(1938) and ‘Autumn’《秋》(1940). His ‘Love’Trilogy 《爱情三部曲》is comprised of ‘Fog’《雾》(1931), ‘Lightning’《电》(1931), and ‘Rain’《雨》(1933). Other important works include ‘A Garden of Repose’《憩园》(1944), ‘Ward No. 4’《第四病室》(1946), and ‘Cold Nights’《寒夜》(1947). Ba Jin received the Fukuoka Asian Culture Prize in 1990. • (1954) Living Amongst Heroes Beijing: Foreign Language Press. • (1958) The Family [trans. Sidney Shapiro] Beijing: Foreign Language Press. • (1978) Cold Nights [trans. Nathan K. Mao and Liu Ts'un-yan] Hong Kong: Chinese University press. • (1984) Random Thoughts [trans. Germie Barme&ecute;] Hong Kong: Joint Publishing Company. (Partial translation of Suizianglu) • (1988) Selected works of Ba Jin [trans. Sidney Shapiro and Jock Hoe] Beijing: Foreign Language Press. (Includes The Family, Autumn in Spring, Garden of Repose, Bitter Cold Nights) • (1999) Ward Four: A Novel of Wartime China [trans. Haili Kong and Howard Goldblatt]. San Francisco: China Books & Periodicals, Inc.